Evidence of Success: What Will Students Be Able to Do? 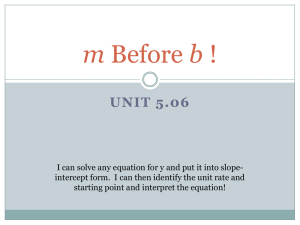  Recognize two forms of a linear equation: standard form and slope-intercept form. constant of proportionality equal to y/x, the slope and a y-intercept of 0. 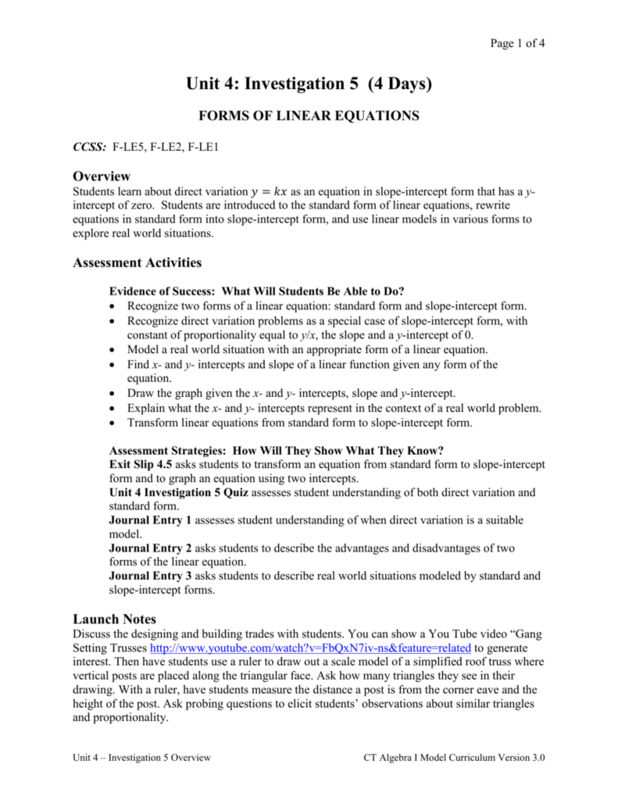  Model a real world situation with an appropriate form of a linear equation.  Draw the graph given the x- and y- intercepts, slope and y-intercept.  Explain what the x- and y- intercepts represent in the context of a real world problem. 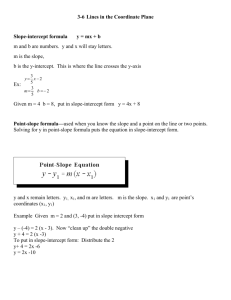  Transform linear equations from standard form to slope-intercept form. Assessment Strategies: How Will They Show What They Know? 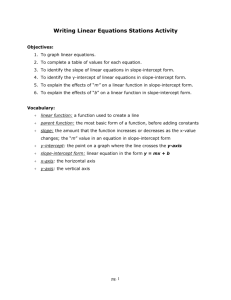 form and to graph an equation using two intercepts. 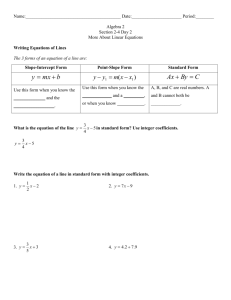 forms of the linear equation. able to choose the appropriate form, and recognize the equivalence of the forms. 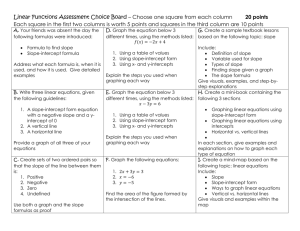 groups or pairs to construct and graph direct variation functions. number of gallons of gasoline purchased. (c) Find the total tutoring bill if a tutor charges $45 per hour. 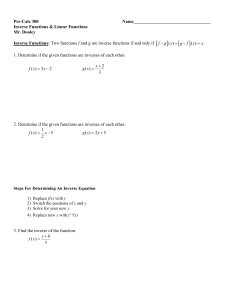 (d) Revisit some distance, rate and time problems. Direct Variation for more practice. A. The plumber charges $60 per hour and a $75 fee for the house call. B. The auto repair shop charges $80 per hour to fix my car. guessing coin values: what combinations of dimes and quarters will total $2? assess understanding of these outcomes with Exit Slip 4.5. 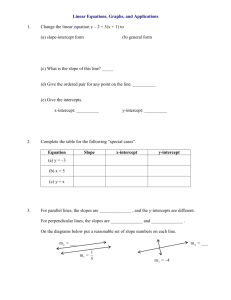 Activity 4.5.5 Practice with Standard Form and Slope-Intercept Form. 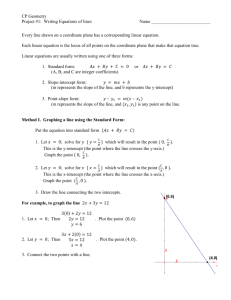 advantages of graphing an equation in standard form? solve for y, and substitute 0 in for y and solve for x.
bolt and hears the thunder. Ask students to justify why this rule works. 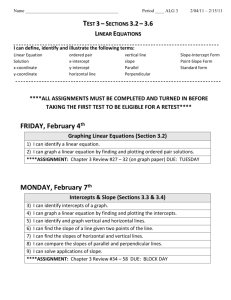 the students have to choose which form of a linear equation to use. when do you use standard form?